The Beatles are one of the most culturally significant pop groups in the world, and have a large connection with the city of Liverpool. John Lennon, Paul McCartney, Ringo Starr and George Harrison are all from the city, and much of their early career surrounded the city, which was further reflected in some of their songs. Formed in 1960, The Beatles acheieved worldwide success following a brief tour of Germany, their first #1 hit single in the UK was “From Me To You”, and they then went on to score 17 number ones in the UK, with 11 of them consecutive. They also were the first band from the UK to be hugely popular in the United States, with 19 #1 Hit Singles on the Billboard 100. Their influence was worldwide, and launched a phenomenon called “Beatlemania” on the world, the likes of which we may never see again. The Cavern Club – Located on Matthew Street, Liverpool, the Cavern Club was opened in 1957 as a place for upcoming musicians to play for free (though that has become a pay to play, with the band losing their deposit if not enough people turn up). The club is widely regarded as the spiritual home of The Beatles, and between the years of 1961 and 1962 the band played more than 250 times at the venue. It shut down in 1973 to make way for the Liverpool Loop (an underground connecting Liverpool with the Wirral and North Wales), but it was reopened in 1984 across the street, and is owned by former Liverpool Football Club defender Tommy Smith. Strawberry Fields – Based in Woolton, Strawberry Fields is a children’s ophanage opened in 1936. Every year they had an annual fair that a young John Lennon attended, and wrote a song about it – “Strawberry Fields Forever”, which was released in 1967. Now a church and prayer centre, the gates serve as a memorial to The Beatles. 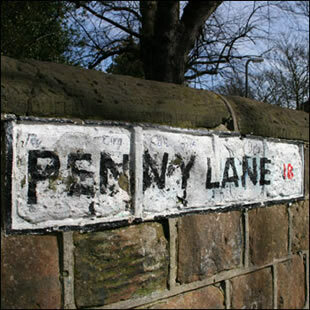 Penny Lane – Located in the Mossley Hill area of Liverpool, Penny Lane was the name of a song penned by the Beatles. A long street, that leads to Allerton Road at one end, and the University Halls of Residence on the other, it’s a must for walking along for any fan, as a lot of the businesses mentioned in the song (such as the barber shop and the bank) are still going today. If you are a Beatles fan, looking for a cheap hotel in Liverpool, you should stay in either the City Centre, Woolton or Mossley Hill, close to one of the landmarks. Otherwise look for the Magical Mystery Tour Bus, where there are tours everyday throughout Liverpool.